I love that beautiful face. I started telling you about my Rambo since he was a rambunctious puppy. Now he is four years old. Where did time fly? He is absolutely gorgeous and the best dog ever. I can't imagine my life without him. He is my shadow and follows me everywhere. He is very attached to me and he loves me as much as I love him. Last year we moved from NYC to Charlotte, NC and he loves it here. Wow, 4 years old already. You're absolutely right - where does the time go? And Rambo - wow, he is one good looking German Shepherd. He really matured well - congratulations! An you moved from NYC to NC - wow, that is one big culture shock too. Moving can be very stressful on our dogs - I'm so happy he's adapted so well and loves his new home. I hope you do as well. 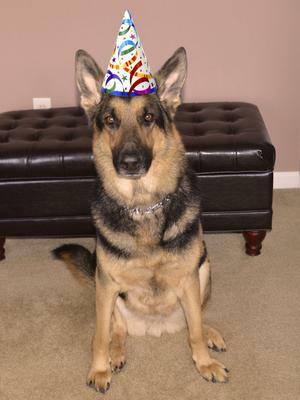 I want to take a second to thank you for giving us the update on your big man Rambo the German Shepherd and also for being a member of our site for all these years. Can you believe it, we'll be 9 years old very soon? 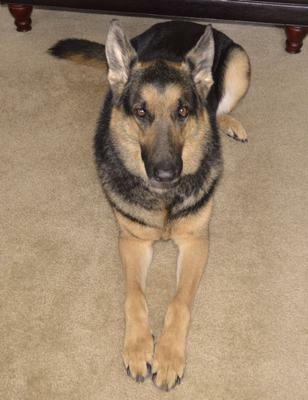 Thanks again and continued success with your handsome young man, your German Shepherd, Rambo!! I wish nothing but the best for you both! Thank you, Linda for your nice comments. Puppy Rambo turned into a fabulous adult dog. He is also very loyal and a great guard dog. I have a security system in my house, but it is Rambo who makes me feel secure. I am sure that Mia is also a beautiful girl. I'd like to see pictures of her. All German Shepherd Dogs are gorgeous. Boy, did he turned out Handsome!!! I remember seeing his puppy pictures. My Mia is 4 too, I can't believe it too how fast 4 years came. I'm sure he is so Protective. Take care of your boy Rambo, he is there for You!! !